Welcome to AMSH. We know that your pet is an important part of your family. That is why we provide compassionate, affordable pet care with 2 locations, one in Tulsa and one in Broken Arrow. Our passion is to give you the best pet care possible. We treat every patient as if they are our own. We treat dogs, cats, birds and exotics. We have been providing exceptional pet care since 1983. No matter where you live, we would love to help you and your pet. We are conveniently located behind the Braums just east of 71st and Sheridan in Tulsa, Oklahoma. Come in to say Hi, take a tour or just chat. Let us know how we can help you. 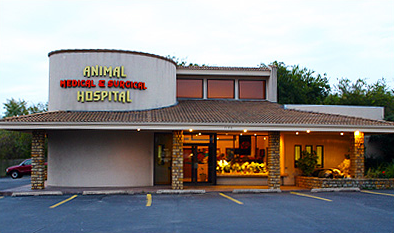 Animal Medical and Surgical Hospital is a full service animal hospital in Tulsa, Oklahoma. Our Doctors have over 40 years of combined experience treating all types of conditions for dogs, cats, birds, rabbits, ferrets, reptiles and many other exotic animals. We offer Vaccinations and Wellness care, Acupuncture, Herbal therapy, Therapy laser, Dental Care and Cleanings, Ultrasound, Surgery, Boarding, Grooming, Exotic Pet care and much more. We make sure that our Animal Hospital is comfortable. And we try to create a very calm environment so your pet can relax in the waiting room and look forward to meeting his or her own doctor. Oklahoma Magazine readers named Animal Medical and Surgical Hospital as one of the "Best of the Best" every year since July 2005. Please, look around our site. Visit our important website link pages, call or email us to get the best, most up to date information about the care of your pet. Call us Today if you have any questions! Call 918-492-2674 or email us at info@AMSHpetvet.com and we'll promptly get back to you. Our Tulsa veterinarian office is very easy to get to. We are just East of the intersection of 71st and Sheridan, just behind the Braums. You can also go to our Contact Us page. Visit our Coupon page to find out how to save money. If you would like to sign up for our Newsletter, give us a call. 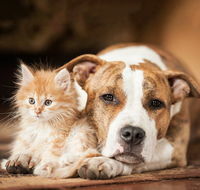 Our Newsletter has pet care information and coupons. At Animal Medical and Surgical Hospital, we treat your pets like the valued family members they are. New Clients!!! Get $20 OFF Your pet's first exam. Cheryl Pfeffer, DVM is a native of Oklahoma. She grew up in the Shawnee area and always knew that she wanted to be a veterinarian. She obtained her Bachelor of Science Degree in 1990 and her DVM degree in 1995 from Oklahoma State University. We are very excited to have Dr. Alison Vanderhoof join AMSH. She is originally from Texas but moved to the Tulsa/ Broken Arrow area several years ago. Dr Thomas was born in Tulsa. She graduated from Jenks high school and attended Oklahoma State University for undergrad and for her DVM. Dr Danner is the past President of the Oklahoma State Board of Veterinary Medical Examiners. He served 3 years as Vice President and 2 years as Secretary/Treasurer. "I cant imagine going anywhere else for my 3 pets. The staff is ALWAYS friendly and treat my pets like their own. They are flexible if you need extra time to pay and I know my pets are in good hands here"
"Very impressed with the attention the staff gave to my pet and I each time we walked through the doors. Thank You!!" "The whole staff was friendly and caring. Can't say enough good things about the facility and staff. They have taken very good care of us every time we've been in. I wouldn't trust the care of my pets to anyone else." "I give you all 5 stars because of the high level of professionalism, compassion, and helpfulness that everyone shows on every visit. We can rest assured our pet recieves the best care possible and that is very comforting." "We were only in to have Marley's nails cut, but nontheless; my dog LOVES to go the the vet! The girls are SO kind, professional, and accomodating. He even loves his doctors. Thank you for all you do!!" "Our pets are bunnies, and we needed them spayed/ neutered. AMSH handled our bun buns and my family with knowledge, courtesy and professionalism. There were no problems or surprises. I totally trust AMSH with our pets. The staff is a blessing." "Caring and Professional staff... and it's genuine." "We appreciate so much the marvelous care given by your whole staff to the precious furry members of our family. We especially appreciate Drs. Danner and Pfeffer. We could not find better physicians anywhere for our babies. Your staff is and has always been courteous, kind and caring. Any questions we have are always answered quickly and efficiently. Your facilities are comfortable, clean and well maintained. I have happily recommended AMSH to my friends! Thank you so much for being there for us." "AMSH makes us feel appreciated and our pets feel loved and cared for. From the moment you walk into the facility to that moment you leave with a smile!" "When we adopted our dog she was sick. With the help of the wonderful staff she was treated great and she loves going there. We take her in to get her nails clipped and they are so friendly and the best." "The AMSH team are always friendly, courteous and professional. They really care and are concerned for their patients (and owners). You are not just another number. I've been going to AMSH for years (upon a recommendation) and so glad I found them." "We have a small Maltese and we couldn't ask for a better pet hospital. From the receptionist, to the nurses and to the doctors - the service is excellent. They seem to actually care about your pet and even follow-up with telephone calls to see how our dog is doing. Friendly...caring...knowledgeable...everything you need for your pet care." "Opal and I had an excellent visit at AMSH and I will recommend AMSH to anyone and everyone I know with pets. Dr. Danner and staff was extremely helpful and knowledgeable." "I feel more comfortable with the care given here than any vet office we have been to in the past. Not only do I appreciate the doctors and staff for their medical care, but I also have high regard for the boarding service. Thank You." "Buffy is always taken care of and I don't have to worry about her when I go out of town. Both doctors are THE BEST!" "Very Professional staff. Very friendly. The doctor and assistants were great. They made it a very positive experience. I was very impressed with the way everything was handled." "At AMSH they always take amazing medical care of my pets and keep my costs as low as they can. I trust them with my pets health and that's saying a lot. They are also very warm and friendly." "Dr Danner has been my vet for 17 years, and has always given excellent service to my pets and I. The staff is always friendly and helpful, and I trust your business with my best friends health and welfare. Thank you all for the wonderful service." "we have been to several vets in three states with our other cat of 13.5 years before he passed. My Mum took our new kitten here for it's initial care and boarding. This is by far the best vet we have ever taken a fur baby to and the most affordable." "Everyone person on your staff is loving and compassionate toward our family. We had a tough decision to make a couple of months ago and we were treated with the utmost dignity and respect. The personal card that you sent touched our hearts forever!" "I finally found a vet who listened and was actually able to help me and my furry kiddo! Dr. Pfeffer was very comforting and informative in a way that wasn't over my head or overwhelming. Hopkins will NEVER see any other vet!" "I am so thankful that I found such a wonderful place to take my furry family. Everyone there is great. I would definitely recommend them to family and friends." "My dog Henry was limping. I brought him to Dr. Danner at AMSH who diagnosed him with a torn cruciate ligament in his knee. Dr. Danner showed me exactly what a cruciate ligament was and why surgery was so important. He did the surgery to fix the problem. We started Henry on glucosamine supplements and he came to visit AMSH weekly for therapeutic laser. Today, he is pain free and he runs and jumps like nothing every happened. We want to send a heartfelt thanks to Dr. Danner and the staff at AMSH for helping our Henry"
"I brought Ava in to see the doctors at Animal Medical and Surgical Hospital because she had been vomiting. The did some bloodwork on her and took some x-rays. We found out that she had eaten one of her ducky toys. The doctor performed surgery to remove it. She did great and she healed up fine. We have since taken away all duck toys so she won't eat any more of them. We felt that the doctors and all of the staff that took care of our Ava loved her as much as we do. They treated her just like their own. Thanks to everyone at AMSH"